No wonder that Physicists (particularly those in Science Communication) are concerned about the “use of metaphor” and the “understanding” it provides. Recently, I found the problem best articulated by Philip Freeman, a teacher of Physics. He has some interest in Philosophy also. He lives near Vancouver BC, Canada. I am copying from his reply to a question at Quora regarding the limitations of analogies. “[W]e’re lazy. Your brain is lazy… it doesn’t really care about understanding things (most of the time), it just wants enough of a handle on them to feel comfortable. And the people explaining things to you are lazy too, they don’t want to try to teach you the messy, tricky, complicated you-really-need-the-math-to-work-with-this stuff. And they know that given your brain’s reluctance to work harder than it has to you probably wouldn’t stick around for that anyway. So they give your brain what it wants — the illusion of understanding. Something to make the strange seem familiar so you have a mental drawer to file it in and can stop feeling that annoying “I don’t know what this means” feeling. They give you an analogy. But analogies are also dangerous because they are inherently wrong. I don’t know how many times a student of mine has come to me in confusion about some point and I’ve realized that it is all my fault because I used a poor analogy, or left it without proper boundaries, so the student over-extended it. I don’t know how many questions on quora come from that same place. It’s a lot. It includes this one. 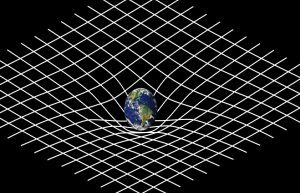 You see when someone says spacetime is ‘bent’ or ‘ripples’ they are using a convenient analogy. They really want to talk about curvature, or wave propagation… but those are very abstract ideas. So they turn to a simple thing that has curvature (more or less) and can carry waves (also more or less)… a surface like that of a flexible fabric / rubber sheet. Now, most of the behaviors you will see on those surfaces are not really the ones that are relevant to what they are talking about. The path of a ball rolling on a sheet with a mass on it doesn’t bend because of curvature as it should if the analogy was any good, but it bends and your brain will be satisfied. The ‘ripples’ on a sheet are not actually the right sort of ripples and have little to do with the actual metric distortions of a gravitational wave. But they move like waves do, and sort-of-kind-of look right, and that’s enough for your brain to feel happy. So you feel happy. So they feel happy (and maybe get your like or upvote or book purchase or whatever). Those are words that Advaitins too should always remember. So don’t be carried away by the snake in the rope or the water in the mirage. This entry was posted in Ramesam and tagged Advaita, Analogy, concepts, metaphor, Physics, Sceince communication, simile, Vedanta by ramesam. Bookmark the permalink. Very interesting! And my first thought was that it is actually worse than this – you didn’t mention the problem of mixing metaphors! My second thought was that it is still worse: in the physics examples, the physicists themselves do actually have the benefit of the ‘real’ explanation, with all of the complex maths to ‘explain’ the phenomenon. In Advaita, on the other hand, there is no mathematical or equivalent explanation. Reality is not objectifiable in any sense. But then I decided that the situations are not actually comparable after all. Metaphor in Advaita is usually used to enable us to see through the complex or seemingly insoluble and realize that it is actually very simple. It was just that we were using our habitual thought modes to look at a situation. In fact, is it not a bit like those lateral thinking puzzles? You cannot see how a particular problem could be solved but this is because you were using the habitual, vertical thinking modes. As soon as you see that there is a novel way of approaching the problem, it all becomes very simple. Forgive me posting this comment here, which is not relevant to your post. I just came across this superb talk by a young Ramakrishna monk at Arunachala Ashram in New York explaining the role of knowledge, meditation and karma yoga; and of Ramana’s atma vichara.